Many people are surprised (even shocked) to find out I’m not upgrading to the new iPhone, especially when they learn I’m currently using an iPhone 7 Plus (now 2-3 generations old). The only iPhone that cost me money was my first one – the iPhone 1. Ever since then, cell phone providers offered two-year contracts with subsidies that didn’t just reduce the cost of the new phone – I actually MADE money upgrading because my old phone would eBay for MORE than the new phone cost. For example, my iPhone 7 Plus cost $319.99 when I bought it more than two years ago (see image). 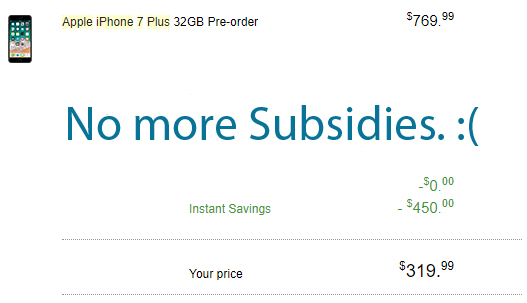 Even Apple will pay me $285 for it NOW through their GiveBack program. Unfortunately, with the least expensive iPhone X (the Xr) ringing in at $749, I would still end up paying $464 out-of-pocket – and that’s before 8.4% in sales tax and $149 for AppleCare. Fortunately, Apple has finally gotten its software development act together so iOS 11 and iOS 12 both run just fine on my iPhone 7. For now, I’m waiting until the next iPhone is a chip that just embeds in the side of your head and provides information via augmented reality, thanks.